Downtown Riverfront Condo! 1 Bedroom LOFT! VIEWS! Wow! MAY AND JUNE MID WEEK DISCOUNTS IN PLACE! Lowest mid week pricing ever? Yes! Book now! THE Place Downtown if you are in town for the Honky Tonks, Music, Sports, and fun! ES, I AM ON THE DOWNTOWN HONKY TONK SIDE OF THE RIVER! This is an urban loft with perhaps the very best views in downtown! Panoramic views of the River, Nashville skyline & the most fabulous music on the planet roll up from ASCEND Music . We are NOT out in East Nashville! You are NOT miles out of downtown. We are half a block from ASCEND outdoor Theater! FREE Garage Parking. Free Wi-Fi! Free Cable. HD TV's! FREE Fitness Center! AMAZING OUTDOOR SPACES including a 6th floor observation deck. 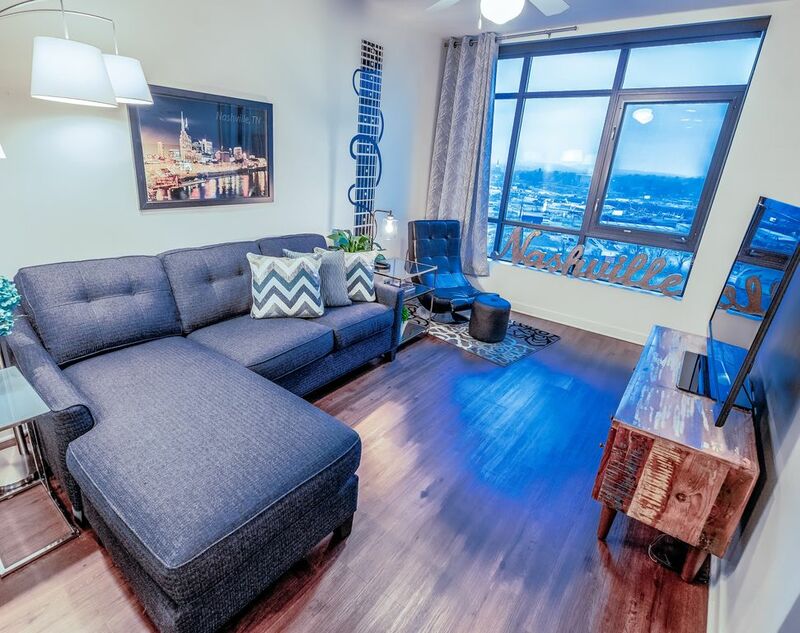 Luxury in downtown so close to everything you can watch fireworks from your window. It's awesome! Half a block to the new Premier Ascend Music Venue, 1/4 mile downhill to the top honky tonks in the world! Yes, this property boasts a parking garage, fitness center, and panoramic views of the skyline. Best seat in Nashville for fireworks too! SoBro - the home of the new 300 million dollar downtown development ~ and the ONLY part of town where we walk 24-7. Riverfront, SOUTH (NOT North!!!! !~!~!~) of Broadway! A LOFT is not a studio. Lofts DO have walls between the bedroom and den, however there are not interior doors except to the bathroom, and closets. This is a true downtown, urban LOFT. Amazing upscale downtown convenience - in a nearly new building. This complex is a historical landmark which has kept the beauty of the history, while offering fabulous new construction. Our 8 story smokestack is featured on Monday Night Football ~ Derek Trucks, and Hank Williams Jr shot a video here in 2015, and scenes for the show NASHVILLE have been shot on sight. Luxury furnishings including a LUXURY PILLOW TOP KING BED, & super comfy QUEEN Inflatable Pillow top sleeper with good linens. 6th floor location only steps to the great Riverfront observation lounge/deck. This complex is fantastic! Fitness center, tech centers, game lounge, riverfront patio, grills, and award winning courtyards. Luxury at it's finest - combined with hip, cool, convenience, and a parking garage. On a scale of 1-10 this place is a total 10! ! ! Perhaps the only property in Nashville run personally by a licensed, bonded, insured property manager - who is hands on! I'm OCD about my properties.... good linens, super nice luxury towels, fun Nashville decor, and top quality mattresses. It's my pleasure and honor to make your stay in Nashville nice. I adore Nashville! LOVE the honky tonks, the bbq, the river and lakes. Who doesn't love to eat at a diner and see some world famous star getting coffee? Laid back, but edgy. Having grown up in Mobile, Alabama, having visited N'awlins more times than I can count ~ my never humble opinion is that Nashville has the MOST KILLER GREAT MUSIC IN THE WORLD! It's absolutely amazing to be at Tootsies and someone like Pink, Tim McGraw, or Gary Allen pops in to sing. Walk down to Ascend for a show and Justin TImberlake jumps on stage. Shop in a local mall and there's Faith, and Taylor, and Steven Tyler. WoW! What's NOT to Love?!?! Join us in Nashville! Fantastic location in the "best part"(our opinion) of downtown! Not the 20'something (college party area) known as the gulch, and not the dark streets North of Broadway :-( WE ARE JUST STEPS FROM THE BRAND NEW MUSIC VENUE *~* ASCEND MUSIC VENUE - the outdoor venue that's making headlines everywhere. We are next door to Pinewood Social - the hip Nashville celebrity hot spot (think Keith Urban and Nicolle). We are only steps from the world famous, and featured on the show Nashville Hermitage Grill where you'll see anyone/everyone at 3 am :~} Very Nice Property in a well to do area with amazing river views. .4 to Music City Center, and honky tonks; less than a block to Ascend Music Venue, across the bridge from Nisson (was LP/Titans) field. Walk score of 9. Fantastic property. Super convenient with a parking garage, pool, fitness center, indoor and outdoor lounges, and a tech center. We are in real estate and took a pass on more than 30 other locations because this is probably (ok, personal opinion!) the most awesome property in all of downtown. Large bathroom with modern cabinets, great lighting; Blow dryer, Walk in closet, large mirrors, plenty of storage area. AMAZING VIEWS OF THE RIVER! Only steps from the hip, cool 6th floor observation deck and lounge. 1 Permit FANTASTIC FEATURE FOR DOWNTOWN! Most places either have you park in a generic parking lot, or an open gravel lot. Parking downtown is Super EXPENSIVE! Great GYM! Yes, you get free access while a guest. It's one of the best ever. Outfitters provide for the river; also, if you are staying on a Saturday you may see the kayak club coming down river ~ VERY FUN! More Patios, Courtyards, Indoor and Outdoor Lounges, and decks than I can name. The good news is that there are so many fantastic areas that you can use something different every day! Salt water pool with skyline views - we don't provide beach towels. We DO provide the required PLASTIC you'll need pool side. This historical property has the gorgeous smoke stack that is featured on Monday Night Football. Music Videos/Photo Shoots are often shot on the riverfront patios. Walk score of 8. Fantastic property is an UNDERSTATEMENT! Super convenient with a parking garage. LOVE the pool. Love that Pinewood Social is just next door. LOVE the burgers and breakfast at the corner - the famous Hermitage Cafe. This is my favorite property in all of downtown, and I look at ALL of them, all the time! Fireworks seen from our riverfront patio is STUNNING. Bear in mind that downtown Nashville is noisy! There is a commuter train with whistles blowing from 6:30 am to 10: pm. & commercial river traffic. The General Jackson comes by with music playing. There is music in the streets, and new construction on every block. Downtown is VIBRANT! full of energy, and NOT GRANNY QUIET! Come have a Blast Riverfront Downtown. You'll LOVE IT. Our stay at this location was great. Other than some minor trouble with the TV (quickly resolved by DaR), our stay in this unit was exemplary. The location was very convenient: 15-20 minute walk to the adventures on Broadway Street, and safe to do in the morning and evening. When we left some clothes at the unit and discovered this 3 hours north of Nashville, we called DaR. She collected our clothes the next day, boxed them up, and endured several FedEx attempts to pick up the box until it was successfully shipped to us. We will definitely look up DaR again on our return trip to Nashville in the future. We had a great time in Nashville, and the condo was perfect. It is close to downtown. The condo was decorated and furnished perfectly. The owners also had great quality towels and toiletries. The kitchen was well stocked. They even had great snacks. We would highly recommend this condo. The owners were quick to respond to our questions. Loved the apartment, very cozy and clean. Great location and had all the amenities we needed. Would definitely stay again! Please stay again - Tootsies Birthday Bash October 10, has BIG NAMES! Let me know you're coming back so I can thank you with a nice discount on all future stays! Easy owner to work with, great location, nice building! Great guests! So appreciate the chance to host your visit. Great place - very comfortable and cozy. Great location!!! Highly recommend! Enjoyed our stay. Great location, we walked everywhere. Great loft, very clean and up to date. Would definitely stay here again. Amazing SoBro - where the new amphitheater ASCEND is located. Fantastic restaurants. The Celebrity place PINEWOOD SOCIAL is just next door. This downtown Riverfront property is the elite location in downtown Nashville ~ plus the amenities! WoW! Saltwater pool, fitness center, grills, award winning courtyard, riverfront patio, tech lounges, game lounges, and the only riverfront observation deck in downtown! Unsurpassed property if you want to walk to honky tonks, and be "in the thick of things" downtown. check in is 3:00pm central; check out is 11:00 am central ~ I am more than happy to allow early check in or late check out anytime I can accommodate it - however, I stay booked. Our bond doesn't allow us to store luggage before check in, or after check out.